I’m mad about accessories but they’re the first thing to come off when the weather warms up. So while I’m hoping the good weather hangs around for an awful lot longer, I’m also loving all the gorgeous autumn accessories that are already trickling into stores. With punk and grunge emerging as the biggest stories of the season, tough jewellery is a wise investment buy. That doesn’t mean you have to spend a fortune though – this grey stone rope necklace (1) is €6 from Penneys and in-store now, while the spike n chain bracelet stack (3; €27) is from Limited Edition at M&S. The stand-out colour for autumn 2013? Cobalt – and River Island is the place to go to stock up. My eye is on this oversized shopper (4), which will be about €60 when it hits stores here over the next couple of weeks. Where there’s grunge and plaid, there’s beanies – the 90s headwear favourite is back with a bang, and the cross stud details give this one (5) extra fashion points. It’s just €3 from Penneys and available now. Finally this black and white, unisex Adidas watch (6) ticks two major trend boxes: monochrome and boy-meets-girl. The street-smart, laidback vibe will pair perfectly with autumn’s more casual trends. 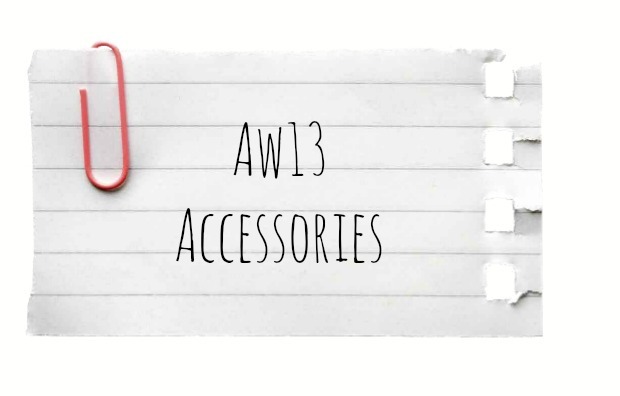 What are your favourite autumn accessories? omg THE BOOTS!! 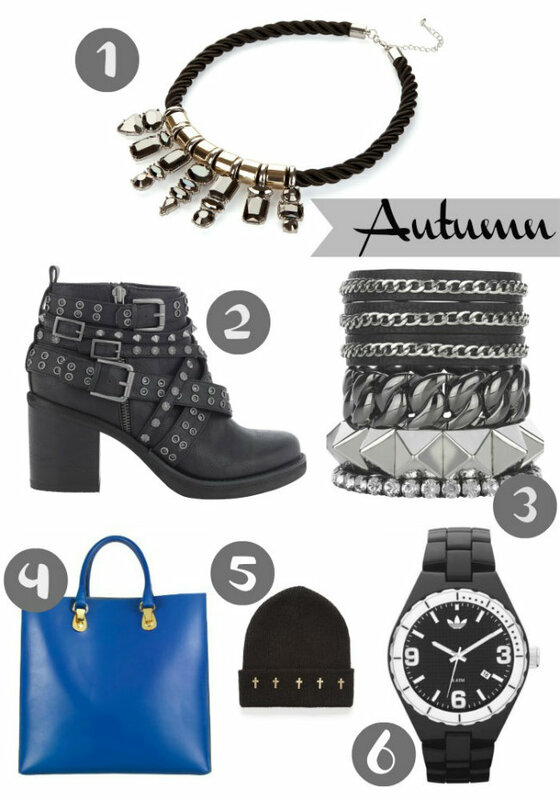 I adore the necklace but the boots <3 need me a pair of those bad boys stat! The cuff is too fun and super edgy! Love the pop of cobalt in your picks Emma! Love the boots! Can't believe they are from M&S!! They look really cool! fab picks, the watch is perfect for grungey styles and adidas always reminds me of the 90s and my adidas gazelles!! Roxy I lived in my Gazelles too! That necklace. €6?! Amazing. God bless Penneys that's all I'll say! the royal blue bag is beautiful! I like the shopper and the watch! i have my eye on that pennys chain too, its fab!! Also sying to get a black watch, think im gonna opt for the casio plain black old school style!! Another fantastic enabling post emma!! I'll be having those boots. I have the rope necklace; it can be worn two ways and its so funky and unique looking. Goes with a number of things dressed up or down. Emma I love the items you've chosen, particularly the necklace! The statement necklace trend seems to be one that's being carried into A/W. I've already started picking up my Autumn accessories here and there, I've already acquired a pair of velvet sunglasses and some black leather ankle boots from ASOS. I can't wait for Autumn now, I'm sick of my summer wardrobe at this stage! haha! I think my heart just skipped a beat at the sight of those boots. Oh, I love the bracelets and the bag! I wish you a fabulous day, sweet Emma! I am totally in love with that blue bag. I became a total believer in carrying bold color handbags as often as possible after I purchased this bold pink Kate Spade bag that always receives a million (okay maybe not quite a million) comments whenever I carry it. Oh loving the arm candy! Oh yeah fall dose not sound so bad right about now. This summer has been rough first the rainest June on record and then the hottest July..hhmmn. Give me that cobalt blue bag! It's gorgeous! I need those boots. Immediately. Not even a case of want. It's a case of NEED. Anyone have any idea when those boots will be instore?